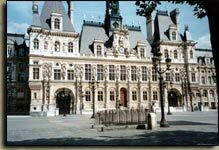 Great monuments of Paris form a unique network both in number and the variety of eras and architectures that they illustrate, they contribute greatly to the reputation of the city. Their visit can relive the great moments in history and appreciate the diversity and richness of its artistic heritage. Practic Hotel is located just opposite the peaceful and charming market square St. Catherine in the Marais, the finest and oldest district of Paris. This small square is surrounded by large buildings constructed in the late eighteenth century, forming a homogeneous whole, with a center median strip planted with white mulberry of China. 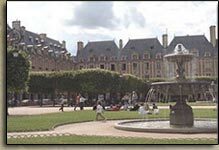 She serves on several particular terrace cafes, bars and restaurants ..
Place des Vosges one of the wonders of Paris, and the oldest monumental square in the capital (seventeenth century). 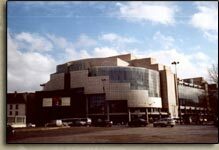 All around you will find numerous cafes, shops, restaurants, antique shops, bookstores and music stores. 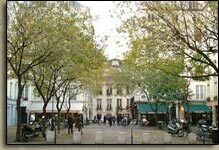 It is above all a refreshing haven of peace and a good starting point for exploring the Marais and rue des Francs Bourgeois. Near the square are the Pompidou center (15 minutes), Bastille (10 minutes), Notre Dame (20 minutes). he Picasso Museum is installed since 1985 in one of the largest mansions in the Marais, the Hotel Sale. It maintains a unique collection of the master (paintings, sculptures, drawings, prints, ceramics ...) from throughout his career and his personal collection (primitive art, paintings by Cezanne, from Rousseau, Matisse, Braque, Balthus ...).